The Santa Clara Valley runs south-southeast from the southern end of San Francisco Bay in Northern California in the United States. The northern, urbanized end of the valley is part of a region locally known as the "South Bay" and also part of the electronics research and manufacturing area known as Silicon Valley. Most of the Santa Clara Valley is in Santa Clara County, including its county seat, San Jose. The valley, named after the Spanish Mission Santa Clara, was for a time known as the Valley of Heart’s Delight for its high concentration of orchards, flowering trees, and plants. Until the 1960s it was the largest fruit production and packing region in the world with 39 canneries. Once primarily agricultural because of its highly fertile soil, Santa Clara Valley is now largely urbanized, although its far southern reaches south of Gilroy remain agrarian. The most northern urban areas are considered part of Silicon Valley. As Silicon Valley is not an actual valley, parts of the San Francisco Peninsula farther north are included in the Silicon Valley region as well. 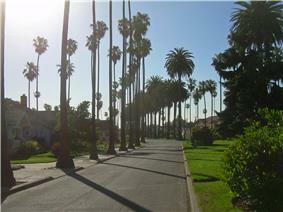 Locally, the urbanized areas of Santa Clara Valley are also referred to as part of the South Bay. Few traces of its agricultural past can still be found, but the Santa Clara Valley American Viticultural Area remains a large wine-making region. It was one of the first commercial wine-producing regions in California (and possibly the United States), utilizing high-quality French varietal vines imported from France. The northern end of the Santa Clara Valley is at the southern tip of the San Francisco Bay, and the southern end is in the vicinity of Hollister. The valley is bounded by the Santa Cruz Mountains on the southwest, which separate Santa Clara Valley from the Pacific Ocean, and by the Diablo Range on the northeast. The valley is approximately 30 miles (50 km) long by 15 miles (20 km) wide. Its largest city, by an 86.7% margin, is San Jose. The population of the valley is 1.81 million people along with approximately 865,700 wage and salary jobs. Santa Clara Valley has a Mediterranean semi-arid climate. Mission Santa Clara de Asís with control over a vast tract of land stretching from Palo Alto to Gilroy was founded by Franciscans in 1777. It served the Ohlone people. San Jose was also founded in 1777 by Spain as an agricultural pueblo. It is the oldest town in California (though there are older missions). There were 66 original settlers. In Spanish and Mexican times the land was devoted to cattle, as was most of California. Following the Mexican–American War San Jose was briefly the Capital of California. The influx of Americans resulted in relocation of many of the native Mexican and Indian people of San Jose to the mission at Santa Clara which had been under control of Jesuits from 1850, They founded Santa Clara University there in 1851. In 1860, as an American town, the population of San Jose was 4,579, with cattle ranching still the main agricultural activity. For a time wheat became the main crop, but in the 1870s fruit gradually became the main crop and processing of fruit by drying or canning the predominant industry. The railroad reached San Jose in 1860. 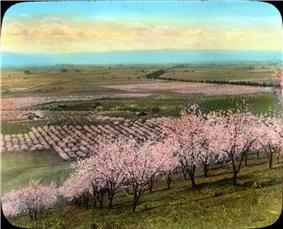 The valley with its scenic beauty, mild climate, and thousands of acres of blooming fruit trees was known as "The Valley of Heart's Delight." Prunes were the major crop and were shipped internationally. Water was supplied from an artesian aquifer. When the water table dropped wells were pumped. Many orchards were small with housing and fruit growing in a dispersed pattern. Del Monte and Sunsweet are two brands which originated in the Santa Clara Valley. The need for workers greatly exceeded the local population. In the nineteenth century Chinese and Japanese immigrants met that need. Toward the end of the nineteenth century many Italians and other immigrants from Southern and Eastern Europe came to the valley and worked in the orchards and canneries. During the 20th century there were Filipino immigrants and increasing numbers of immigrants from Mexico who during World War II became the dominant agricultural workforce. Italians, who often had experience with raising fruit trees in the old country, did well. The town of San Jose was dominated by its business community, in some part Irish Catholic (San Jose was never dominated by Anglo-Saxon Protestants), who had a self-contained social life which did not include immigrant labor. However, in the twentieth century 3 Italian Catholic churches were established as was a Portuguese. There was marked prejudice against Asians, particularly Chinese, who gradually left the valley. ^ Valley of Heart's Delight : Free Download & Streaming : Internet Archive. Archive.org (2001-03-10). Retrieved on 2013-07-21. ^ Golden Harvest...Fifty Years of Calpak Progress : California Packing Corporation, Industrial and Public Relations Department : Free Download & Streaming : Internet Archive. Archive.org. Retrieved on 2013-07-21. ^ Santa Clara. Ohp.parks.ca.gov. Retrieved on 2013-07-21. ^ Almaden Winery History from NCD. Awna.org (1997-01-23). Retrieved on 2013-07-21. ^ Glenda Matthews (November 20, 2002). Silicon Valley, Women, and the California Dream: Gender, Class, and Opportunity in the Twentieth Century (trade paperback) (1 ed.). Stanford, California: Stanford University Press. p. 14. ^ Glenda Matthews (November 20, 2002). Silicon Valley, Women, and the California Dream: Gender, Class, and Opportunity in the Twentieth Century (trade paperback) (1 ed.). Stanford, California: Stanford University Press. pp. 14–32. ^ Glenda Matthews (November 20, 2002). Silicon Valley, Women, and the California Dream: Gender, Class, and Opportunity in the Twentieth Century (trade paperback) (1 ed.). Stanford, California: Stanford University Press. pp. 53–64. ^ Glenda Matthews (November 20, 2002). Silicon Valley, Women, and the California Dream: Gender, Class, and Opportunity in the Twentieth Century (trade paperback) (1 ed.). Stanford, California: Stanford University Press. pp. 48–80. ^ "Northrop Grumman Marine Systems Celebrates 100 Years in Operation in Sunnyvale, California". ^ Glenda Matthews (November 20, 2002). Silicon Valley, Women, and the California Dream: Gender, Class, and Opportunity in the Twentieth Century (trade paperback) (1 ed.). Stanford, California: Stanford University Press. pp. 119–22. ^ Glenda Matthews (November 20, 2002). Silicon Valley, Women, and the California Dream: Gender, Class, and Opportunity in the Twentieth Century (trade paperback) (1 ed.). Stanford, California: Stanford University Press. pp. 81–146. ^ Glenda Matthews (November 20, 2002). Silicon Valley, Women, and the California Dream: Gender, Class, and Opportunity in the Twentieth Century (trade paperback) (1 ed.). Stanford, California: Stanford University Press. pp. 95–102. ^ Glenda Matthews (November 20, 2002). Silicon Valley, Women, and the California Dream: Gender, Class, and Opportunity in the Twentieth Century (trade paperback) (1 ed.). Stanford, California: Stanford University Press. pp. 52–53. ^ "Josephine and Frank Duveneck Life, Part 1". losaltoshillshistory.org. Retrieved February 7, 2015. ^ Glenda Matthews (November 20, 2002). Silicon Valley, Women, and the California Dream: Gender, Class, and Opportunity in the Twentieth Century (trade paperback) (1 ed.). Stanford, California: Stanford University Press. pp. 105–108. ^ "Production Occupations (Major Group)". bls.gov. Bureau of Labor Statistics. May 2014. Retrieved April 25, 2015. ^ Glenda Matthews (November 20, 2002). Silicon Valley, Women, and the California Dream: Gender, Class, and Opportunity in the Twentieth Century (trade paperback) (1 ed.). Stanford, California: Stanford University Press. pp. 154–56. ^ "Occupational Employment Statistics Semiconductor and Other Electronic Component Manufacturing". bls.gov. Bureau of Labor Statistics. May 2014. Retrieved April 25, 2015. ^ George Packer (May 27, 2013). "Change the World Silicon Valley transfers its slogans—and its money—to the realm of politics.". The New Yorker. Retrieved July 30, 2015. In wealthy districts, the public schools have essentially been privatized; they insulate themselves from shortfalls in state funding with money raised by foundations they have set up for themselves. ^ "Early History". 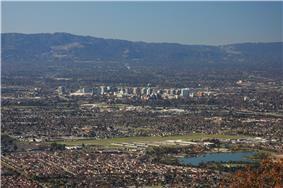 Santa Clara County: California's Historic Silicon Valley. ^ Website New Almaden Quicksilver County Park Association contains numerous links to multiple resources. ^ "San Jose, CA Typical Weather". ^ "Vacation Planner". Weather Channel. Retrieved 2009-05-22. 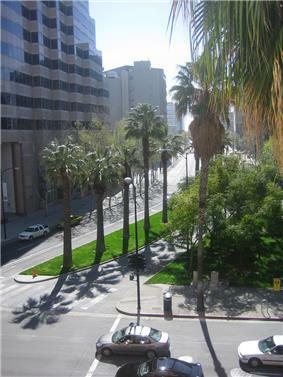 San Jose city streets are commonly lined with palm trees. The climate of the Santa Clara Valley in Gilroy) the temperature frequently exceeds 95 °F (35 °C) in the summer months. Winter is the rainy season, but still quite sunny. Winter highs range form 57 °F (14 °C) to 66 °F (19 °C) while lows range from 40 °F (4 °C) to 48 °F (9 °C). Summer highs range from 82 °F (28 °C) to 95 °F (35 °C) and summer lows range from 53 °F (12 °C) to 58 °F (14 °C). 37,388 metric tons of mercury were extracted from the New Almaden mine south of San Jose and north west of Santa Cruz during the 19th century. The area, closed for many years, resulted in pollution of the Guadalupe River and South San Francisco Bay After final cessation of intermittent mining operations during the 20th century the area was purchased by Santa Clara County for a park and designated a National Historic Landmark. The valley is a graben between the San Andreas and Hayward faults. Santa Clara Valley was created by the sudden growth of the Santa Cruz Mountains and the Diablo Range during the later Cenozoic era. This was a period of intense mountain building in California when the folding and thrusting of the Earth's crust, combined with active volcanism, gave shape to the present state of California. Hence, Santa Clara Valley is a structural valley, created by mountain building as opposed to an erosional valley, or a valley which has undergone the wearing away of the Earth's surface by natural agents. The underlying geology of the Santa Cruz Mountains was also formed by the sediment of the ancient seas, where marine shale points to Miocene origin. Today one can still find evidence of this in the Santa Cruz Mountains, where shark's teeth and the remains of maritime life are still found as high as Scotts Valley, a city nestled in the mountains. The highest peak on the Santa Cruz Mountains side of the valley is Loma Prieta at 3,790 feet. The highest peak in the Diablo Range side of the valley is Mount Hamilton, specifically Copernicus Peak at 4,370 feet elevation. This is the highest peak in Santa Clara County. Some cities in the East Bay or especially on the Peninsula sometimes are referred to as part of the region. Many of these cities including Menlo Park, Redwood City, Newark, and Fremont are considered part of the Silicon Valley (and therefore the South Bay) because of their relative peripheral location to Santa Clara County, history, or concentration of high-tech companies. 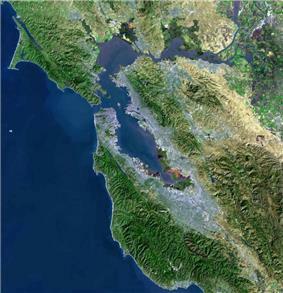 The conception of the South Bay as a region is relatively new compared to that of the Peninsula and coastal East Bay, and the cities of northwestern Santa Clara County (Palo Alto, Los Altos, Mountain View, and sometimes as far as Cupertino and Sunnyvale) maintain an identity more strongly connected to the Peninsula and the Stanford campus than the City of San Jose. Additionally, the counties of Santa Cruz and San Benito are considered part of the South Bay by the Bay Area media although the two counties are often considered to be their own subregion centered on the city of Santa Cruz. Many other cities, towns or census-designated places are also sometimes considered part of the region, such as the San Lorenzo Valley towns between Saratoga and Santa Cruz. The South Bay is a subregion of the San Francisco Bay Area, California, United States and is roughly synonymous with the Santa Clara Valley, Silicon Valley, and Santa Clara County (in general). The South Bay is one of several Subregions in the Bay Area including: San Francisco, the North Bay including parts of the Wine Country, the Peninsula, and the East Bay, among others. Because so much high-tech industry has spread out from the Silicon Valley, Fremont and Newark, even though they are not in Santa Clara County, are often included in discussions about the Silicon Valley or, in the case of Fremont, is referred to as the Gateway to the Silicon Valley (a title also claimed occasionally by San Jose, Union City, and several other locations). Similarly, Palo Alto, while in Santa Clara County and considered part of Silicon Valley, is on the San Francisco Peninsula. Looking west, across the valley, from Alum Rock Park over northern San Jose (downtown is at far left) and other parts of the valley. The valley runs north to south in the picture. The Santa Clara Valley region is the prosperous center of the global personal computer and internet industry. Manufacture of transistors is, or was, its core industry. The production workforce was for the most part composed of Asian and Latina female immigrants who were paid low wages and worked in hazardous conditions due to the chemicals used in the manufacture of integrated circuits. Technical, engineering, design, and administrative staffs were in large part male and well compensated. Later Frank and Josephine Duveneck of Los Altos Hills who founded Mexican-Americans from the mid 50s. San Jose was the first major city in the United States to elect a woman mayor, Janet Gray Hayes in 1975. There were a small number of liberal intellectuals and radical activists who influenced public affairs even in the 1930s when Charles Erskine Scott Wood and his second wife Sara Bard Field entertained at their estate, The Cats, in Los Gatos. St. James Park in San Jose was an open forum where IWW activists and others spoke to the public. In 1950 Dutch Hamann was appointed city manager of San Jose. Hamann's boosterism was supported by Joe Ridder, publisher of the San Jose Mercury. In power until 1969, Hamann created a master plan for San Jose and embarked on a program of annexation that increased the area of San Jose from 17 square miles to 136.7 square miles. The main bargaining chip was the superior sewage system built to handle cannery waste. To overcome resistance by school districts, who otherwise would have lost their tax base, annexed areas were allowed to maintain independent school districts. This resulted in some parts of the city such as East San Jose having low-quality segregated school systems with a low tax base while school systems in other parts of San Jose have an ample tax base and high-quality schools. The population of San Jose increased from 95 thousand in 1950 to 446 thousand in 1970. There were critics: Santa Clara County Planning Director Karl Belser, who opposed urban sprawl, commented. "Perhaps the only use we will ever find for the hydrogen bomb will be to erase this great mistake from the face of the earth." Housing for each additional 1000 people took 257 acres of land. In the 1950s the transistor industry was established which led, together with Xerox and Stanford University research and the Digital Revolution, to the Valley becoming Silicon Valley, a premier electronic technology center. The Polaris missile was a Submarine Launched Ballistic Missile (SLBM) built during the Cold War by Lockheed Missiles & Space Division in Sunnyvale for the United States Navy while Northrop Grumman Marine Systems built the launch tubes and propulsion systems. For the most part the defense industries and traditional electronics manufacturers, with the exception of IBM, in the Santa Clara Valley were unionized, mainly by International Association of Machinists and Aerospace Workers, International Brotherhood of Electrical Workers, and Teamsters. The United Electrical, Radio and Machine Workers of America, a communist dominated union, but friendly to minority and women workers, gradually lost its place during the McCarthy era. The fruit industry gradually recovered and by the early 1940s prosperity returned to the valley. Wartime production associated with World War II brought industry to the valley such as building of marine engines for Liberty ships by the Joshua Hendy Iron Works, an historic mining and mill machinery manufacturer, now Northrop Grumman Marine Systems in Sunnyvale, landing craft were built by Food Machinery Corporation (FMC later built the M113 (APC) Armored Personnel Carrier and the Bradley Fighting Vehicle as well as the XR311 at its facility in Santa Clara), and an IBM factory began manufacturing punch cards in San Jose in 1943. About 1,000 Japanese were interned, losing substantial property. Wartime production drew workers, including women, from the orchards and canneries; they were replaced by Mexican Americans from Texas and California and by Mexican braceros. Neighborhoods in East San Jose, such as the Meadowfair district, became barrios.